So it never fails… every time there is a thunderstorm my toddler is up crying. The recent storm decided to make a loud clash of thunder around five a.m. this morning. So after attempting to settle my newborn at four am and she refused to sleep anywhere but in my arms I decided to give up on sleep and just snuggle my babies helping them rest in my bed. That’s after Katia awoke at ten pm, midnight and one a.m. so basically I never slept at all. It is actually pretty impressive that I’m typing let alone walking or talking today. I feel like I’m drunk twenty four seven and not the fun buzzed part of being drunk, but the part where you get tired and don’t feel well. Katia really needs to start loving sleep soon or bumping into walls will become a normal start to my daily life. You know what else never fails, these sleep deprived days usually happen when we have a family party or get together to attend. To combat these hectic times I love easy side dishes that I can assemble the night before. 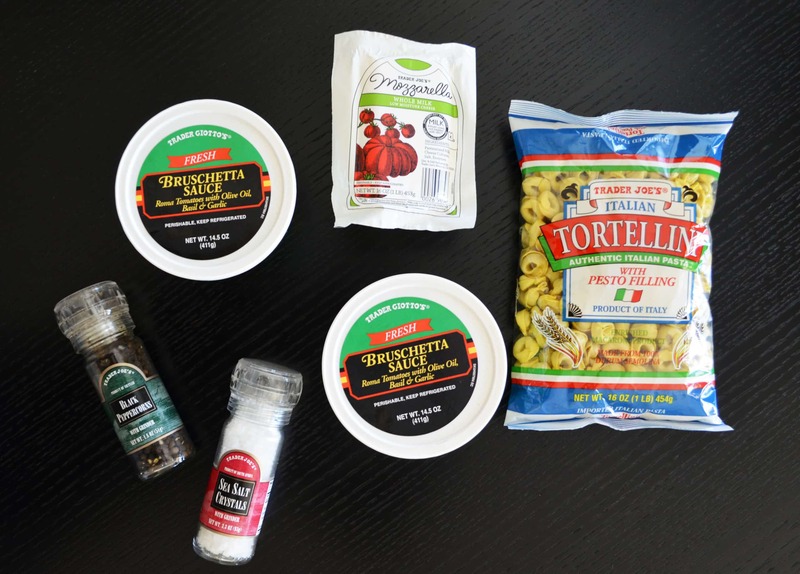 This Easy bruschetta tortellini is one dish everyone should use in times of chaos, even the culinary challenged will find this pasta to be simple. Don’t let the simplicity of this dish fool you… its delicious and a real crowd pleaser. So much that I bring this dish to most family get togethers upon every ones request. Toddlers love it, adults love it and I don’t have to miss out on anymore sleep which makes this a huge victory in my book.